This is going to be an interesting review, as I don't believe you can purchase this item on its own yet, however, it is certainly worth discussing! 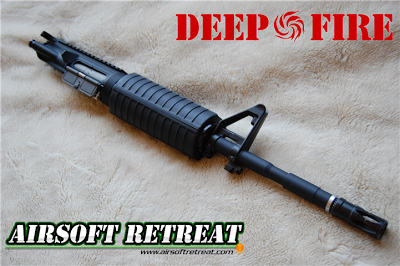 Deep Fire has put together a new hop-up system for M4 AEGs, that is similar to the system used in Systema PTWs. It does not use a traditional bucking or nub, instead using a totally different system including the inner and outer barrels. This hop-up system is installed in Deep Fire's “Professional” line of M4 AEGs, however, they sent me the kit as well as a new upper receiver and outer barrel so that I could install it on my Deep Fire Silver Series test mule. This gun has previously had a full titanium gearset, M120 FTK, and graphite fiber piston head installed, and is continuously evolving as a test gun for new Deep Fire products. Keep reading for more information on this interesting hop-up system! As mentioned before, I was sent this upper receiver and hop-up set directly by Deep Fire. Currently, it is only available in Deep Fire's professional series of AEGs, but it may be available on its own soon. Now, normally a hop-up system consists of an inner barrel with a rubber bucking slid over it, inserted into a plastic or metal hop-up housing with a cylindrical rubber nub pushing into the bucking, giving you backspin on your BB. This has some downsides, namely the potential for air-leaks, inconsistency with the bucking/nub system, and wear and tear due to friction on the bucking material. This kit alleviates these issues by getting rid of the bucking entirely, instead using a nub installed on a metal rod that actually sits in the barrel itself, directly hitting the BB with no bucking in between. The air-seal is provided by the metal body of the housing itself, as well as the use of several O-rings and sealing bellows. Adjustability is also changed, as instead of using a side mounted wheel that can loosen up with time, you have a bottom mounted hex screw for consistent adjustments. When I received the receiver set, it was simply packaged in a cardboard shipping box. There was no other packaging or labeling on the kit, which makes me think it may not be available on its own. My first thought upon pulling the set out of the box was how solid the barrel and receiver were connected. There is absolutely zero wobble in these parts. Now, the upper receiver itself is a standard Deep Fire unit, with no real changes to it, however the outer barrel is the new design required to fit the new hop-up. It locks into the receiver using the same Delta ring, however it is kept from rotating using a metal insert that locks both into the barrel and receiver. This makes it incredibly solid once the Delta ring is tightened down. There are changes to the outer barrel to fit the larger, more robust hop-up system, so the barrel cannot be easily replaced with a different length. The hop-up system and inner barrel are the real stars of this show, so I will be spending most of my time in this review on them. As you will see, it is an entirely different design than the TM standard hop-up that you are used to. The body of the hop-up system is made of machined aluminum, and consists of a multitude of parts. Upon disassembling the unit, you will find that it is much more complicated in design compared to a standard TM style hop-up, however, in execution it is painfully simple. The first thing you will notice is that the inner barrel has an entirely different cut and shape compared to a standard inner barrel. This allows the hop-up ring to surround the inner barrel with no side to side free play, as well as allowing the new hop-up nub to sit down inside the barrel. The hop-up effect is applied using the aforementioned metal ring and rubber nub. Unlike standard hop-ups, the nub directly touches the BB, instead of touching it through a rubber bucking. This is more consistent, and leads to less wear and tear on the nub. The other function of a hop-up bucking is to seal the chamber, to allow the most air possible to flow through with the least amount of air loss as possible. This is normally accomplished by having the bucking be squeezed as tightly as possible both around the inner barrel, and pushed against the walls o the hop-up housing. This can obviously have some flaws, due to the tight tolerances required. Deep Fire gets around this by using first an O-ring on the barrel, followed by an O-ring on the stabilizing inner barrel insert, and finally by using a brass and rubber gasket between the inner barrel and hop-up body. The combination of these parts leads to a perfect seal with no discernible air loss. You can plug both the BB feed hole and the inner barrel and try to blow into the hop-up body, and there is zero leakage whatsoever. So, how does this all come together? First off, the inner barrel must have the O-ring and hop-up ring installed. Once they are installed, a small rubber spacer gets installed at the bottom of the hop-up ring. You can then install the barrel stabilizing cylinder over the inner barrel, pushing it onto the O-ring. The gasket must be installed into the hop-up body at this point. It will slide down fairly easily, but you may need to use a tool to push it flush with the opening at the base. You can now slide the entire inner barrel assembly into the hop-up body, aligning all three oval windows at the top. Once they are aligned, insert the black metal piece into the oval, which locks everything together and prevents side to side free play. You can now install the adjustment hex screw on the bottom of the hop-up body, and slide the hop-up and inner barrel into the upper receiver, aligning the notch at the top of the hop-up body with the extended portion of the outer barrel. As far as adjusting the hop-up, screwing it in tighter gives you less hop-up force, so some trial and error will be required on your part to get the gun shooting perfectly. The adjustment point is the biggest downside to this system that I can think of, as you have to remove the magazine and use a long hex wrench to adjust it, something not easily done in the field. The benefit of the rest of the system is that you shouldn't really need to change it too much between games. Set it for the ammo you normally use, and it shouldn't require much tweaking from day to day. So, this thing looks cool, and is impressively stable, but how does it perform? Before installing the kit, I was getting about 406 FPS with good consistency. The biggest point of inconsistency that I could determine was the standard style hop-up. As much as I tried, I couldn't get rid of the air leak at that point. With the new hop-up installed, I got a healthy bump in FPS, up to 418 FPS, and consistency is now FANTASTIC. I'm getting +/-1 FPS now, peaking at 419 and only going down to 417. I haven't had an AEG shooting with this kind of consistency before, ever. Accuracy and range both had a healthy boost as well. Before, I could hit my standard torso sized target at 165' 90% of the time. This was certainly skirmishable, but I always felt that the side to side deviation at that range killed my hopes of further shots. I also couldn't put enough backspin to spin my preferred .28g Echo 1 BBs out to that range at that power level. With the new hop-up, it has plenty of backspin to throw the .28s out to 185' reliably, with zero side to side deviation until they lose their energy and drop straight down. I'm now comfortable not only engaging out to 180' , but further by lobbing the shots slightly, as they're quite consistent now. One of the unsung benefits of this system is the way the hop-up sits between the gearbox and the upper receiver. It almost acts like an STS system, transferring the impact of the piston through the hop-up body and into the receiver, preventing gearbox shell failure. As high quality as the new upper receiver and barrel felt, they were boring. It had plain Jane M4 handguards and a triangle front sight installed, which works great for some people, but I like my guns with a little more zest. I elected to install a 12” RIS, which was not a free float system. This required me to use the front spear ring, as well as a low profile Noveske gas block to keep everything secured. Eventually, I'll probably install 12” free float RIS and ditch the spear ring, but for now, it has a very unique look to back up its killer performance. I wasn't really sure what to expect with this kit, as I haven't had any experience with this new hop-up system before. I thought that with some work, the TM system can be as good as you'll ever need. Frankly, this system blows any of the standard hop-up combinations that I've used out of the water in my experience. It is super consistent, has a fantastic air seal, and has the potential to give you a lot higher hop-power than you can get with a standard hop-up. I can only hope that they make the system available for sale on its own, so more users can try it out.